1. What is Gaia Meditation? Gaia Meditation® is a website promoting well-being, personal development and spirituality. Originally, this is the name of a meditation method created by the founder of this website Stephane Clement. 2. What are the benefits of meditation? For more than 60 years, hundreds of studies on meditation have been conducted. Globally, meditation helps to keep you healthy, make you happier, improve your performance in physical and mental task, and even help in preventing multiple diseases. 3. How often should I meditate to experience benefits? Scientific research has shown that meditating 20 minutes per day for 8 weeks would already provide concrete benefits. So if you feel like meditating more, just do it. What is important is to do it on a regular basis and turn it into a habit just like eating and drinking. And always keep in mind that if you have time to watch TV, play video games or browse the internet, it means you have time for meditation. It all depends on what you want in life and how you value your well-being. Need help for meditation? Try Guided Meditation. 4. Can your free audio programs help me to improve my meditation practice? Yes! On our Free Music Page, you will find powerful meditation music, specially designed to enhance your meditation practice. And, even if you have never practiced meditation before, our meditation music embedding binaural beats, isochronic tones, Solfeggio frequencies (528 Hz…) or 432 Hz, will put you in a deep meditative state without any efforts. You can try our Theta programs which are highly effective for meditation. If you need help for your meditation practice, we also offer powerful free guided meditation audio tracks. The Dalai Lama meditates 4 hours every morning. If you have time for that, you’re lucky… If you don’t, meditating with the help of our audio tracks will make you gain tremendous time and experience incredible results in an efficient way. 5. What is the particularity of your audio tracks? Each Gaia Meditation audio track includes a combination of sound frequencies which have specific effects on the body and mind. 100% free streaming available on our website and on Gaia Meditation YouTube channel. Available for free download on our site: once downloaded, you can listen to the audio tracks wherever you want without being disturbed by any WiFi waves… Please note that the recordings are free for private use only. If you would like to download them for a non-private use (commercial purpose etc. ), you must get a license here. High-Quality MP3 (320 kbps), which means: high rendition of sound frequencies to ensure optimal benefits. All of our audio tracks are developed based on scientific research (brainwave entrainment: binaural beats and isochronic tones) and on metaphysics studies (432 Hz, 528 Hz and other Solfeggio frequencies). They are produced by sound experts, experienced music producers who are used to work with sound frequencies in a very precise manner. Listening to our audio tracks (especially embedding binaural beats or isochronic tones) will drive you rapidly into an optimal conscious state for a particular purpose (meditation, relaxation, sleep etc.). Top quality guided meditation audio tracks combining a soothing voice and deep meditation music, to help for your pratice. Powerful subliminal music embedding positive affirmations (“suggestions”) to help you reprogram your subconscious mind in an effective way. Please note that even if we encourage the practice of meditation, you don’t need to practice any specific type of meditation to get benefits from our audio tracks. Just listen to the music in a quiet place and comfortable position, and the sound frequencies will do the job in a very effective way. Looking for free meditation music (guided or not), free relaxation music, free sleep music, free subliminal music and other powerful Sound Healing programs? 6. How to compress my audio files for my smartphone, iPod etc.? 7. How are the frequencies chosen in each audio track? All of our audio tracks are produced following documented studies which link certain frequencies to certain properties. To produce any Gaia Meditation audio track, we use what we consider is the best data available on the given subject. a metaphysical approach with the use of Solfeggio frequencies, including the Love frequency 528 Hz, and the universal frequency 432 Hz. 8. What are the audio programs supposed to do? Our audio programs are designed as an aid to reach specific objectives. For example, on Gaia Meditation website, you’ll find free music for: meditation, relaxation, sleep etc. If you need help for your meditation sessions, we also offer free guided meditation audio tracks. And our free powerful subliminal music will help you reprogram your subconscious mind in a quick and easy way. Every audio track uses specific sound frequencies as an external stimulus to drive your brain activity into a desired mental state and have an optimal effect on your mind and body. 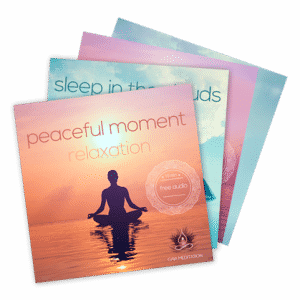 Our audio tracks embedding the sacred frequency 432 Hz will help you to be more in harmony with the Universe, expand your consciousness, release emotional blockages and fill you with a sense of peace and well-being. Looking for guided meditation, relaxation music, sleep music, subliminal music and other powerful Sound Healing programs? 9. What’s the best between 432 Hz and 528 Hz/Solfeggio frequencies? 432 Hz and 528 Hz/Solfeggio frequencies are all sacred frequencies and could be seen as different chords of the same Universal melody. There have been testimonials of healing vibrations for the mind and body with 432 Hz as well as with 528 Hz/Solfeggio frequencies. So, we recommend you to experiment with both types of music and feel what works best for you. 10. What’s the difference between binaural beats and isochronic tones? 11. What’s the difference between guided meditation and subliminal music? Both guided meditation audio tracks and subliminal music are tools to help you “master your mind”. Gaia Meditation audio tracks use the technology of brainwave entrainment which allows you to access the optimal brain state to be receptive for guidance (guided meditation) and suggestions (subliminal music) to reprogram your subconscious mind. In guided meditation, the spoken voice is audible. The voice is used as a guide for your meditation practice (help for relaxation, visualization etc.). In subliminal music, the spoken voice is not audible. The volume of the affirmations (“subliminal suggestions”) is recorded below the threshold of conscious perception to facilitate access to the subconscious mind. If you would like to reprogram your subconscious mind in a quicker way, using subliminal music is more effective than guided meditation because the affirmations passes through the analytical mind and the subconscious mind is addressed directly. It is thus easier for these affirmations to be accepted as your new reality, and to change your thoughts, attitudes and habits. When you listen to subliminal music, you don’t have to be focused because you can’t hear any spoken voice anyway. So, for example, you can listen to subliminal music when you study or even when you sleep. If you listen to a guided meditation, you’ll need to stay focused and follow the guidance, except if the meditation objective is to sleep. 12. How to use our audio tracks? Any recommendations? you need to be in a calm and relaxed environment. you need to do it at the right time, meaning you shouldn’t be distracted or interrupted in any way while you are listening. This is your moment! So for example, you should turn your phone off or put it on “flight mode” if you’re listening to the audio tracks from your phone. You can sit or lay down on a bed or couch depending on the audio program that you’re listening to. You always have to be in a comfortable position, with no physical blockage. Always try to keep your body straight and centered. If your aim is to sleep, then you may lay on your bed. You must use headphones if your audio track contains binaural beats, otherwise it’s not an obligation but recommended. Good quality headphones, light and comfortable, are recommended to fully experience the benefits of the audio tracks. The volume shouldn’t be too loud. Close your eyes and start by focusing on your breathe a few minutes as a start. If you need help with meditation, you may want to check out our free guided meditation and Gaia Meditation method. 13. Are headphones required to listen to your audio programs? For any audio programs including binaural beats, the headphones are required because of the highly specific frequencies applied to each ear. For the rest of our audio tracks including isochronic tones, pure 432 Hz or pure 528 Hz/Solfeggio frequencies, headphones are not required but recommended to allow the frequencies to be heard at their purest form, without being disturbed by any background noise. 14. How long does it usually take to experience results with the audio programs? It depends on each individual but with audio tracks embedding binaural beats or isochronic tones, some people experience immediate results within minutes and globally after the first listening. Also, changing thoughts, attitudes and habits with the help subliminal music should take shorter time than with other audio programs as the affirmations layered in the music will penetrate directly in your subconscious mind. Generally, it takes 21 days (3 weeks) for the subconscious mind to absorb, accept and integrate new information. If you wish to have long term results, we recommend you to listen daily for the first 6 weeks, then as needed to achieve the results you desire. This is the amount of time necessary to change brain patterns, thoughts and behavior patterns. You should be patient and experiment to find what works best for you. The longer you continue to listen, the more permanent the changes and improvements. One thing to remember is to try to feel what you are doing and be aware of the purpose of it. In this way, things will even be more efficient. 15. Are the effects of your audio tracks supposed to be permanent? The long term goal is to train your brain to naturally change its frequencies on-demand (especially with audios embedding binaural beats or isochronic tones). You should eventually acquire the ability to adjust your mind state and thinking parameters according to your current situation. Of course, we suggest keeping on listening to the audio tracks on a regular basis as they will always provide positive reinforcement and prevent your mind from regressing and being dispersed, which is also natural. Please note that if some people learn faster, some others will regress faster, so take actions according to what you feel is best for you always. 16. How often should I listen? We recommend you to listen to our audio programs on a daily basis for the first 6 weeks. Only for audio tracks containing brainwave entrainment (binaural beats and isochronic tones): you should limit your listening to 60 minutes per day because they alter electrical activity in your brain. Depending on which program you’re listening to, if you listen to more than 60 minutes of music including binaural beats or isochronic tones, it can slow down or revive up your brain activity. Too much of either state can interfere with your normal daily functioning. Anyway, feel free to experiment, and if you’re not liking the results, you should limit your use to the recommended times. Exceptions: sleep audios (for example “Deep Sleep”) and “Healing” programs, including Delta waves. You could listen to them for a longer time than 60 minutes as it may deepen your sleep and accelerate your healing. You’ll see how you feel, just do what’s best for you. At Gaia Meditation, you will often find at least 2 versions of the same audio track: one with Brainwave Entrainment (binaural beats or isochronic tones) and another one without. So you will always have the opportunity to find what’s best for you. 17. Can I combine multiple audio topics in 1 day? Yes, you can listen to more than 1 topic per day because your brain has amazing learning capacity. In case you want to listen to different audio tracks with brainwave entrainment (binaural beats or isochronic tones) consecutively, just check if the topics are related: if yes, then it is fine; otherwise if the topics are different, just allow your brain time to return to its normal conscious state before beginning a new session. And if you wonder in which order you should listen to your different audio tracks, just experiment, trust yourself and see what works best for you. However, for example if you are close to go to sleep and you want to listen to a program including Alpha waves and one with Delta waves, just listen to the Alpha first and then Delta of course. Please read the descriptions of each brain state to determine what kind of mental energy you desire and at what time of the day. For audios with brainwave entrainment, remember to always limit your listening to 60 minutes per day (except for sleep and healing programs – see FAQ 16). 18. I have partial hearing loss in one ear. Will your audio tracks still work? First of all, some of our audios include a spoken voice which is audible (guided meditation) or not (subliminal music). Therefore, depending on your level of hearing loss, you have to take that into account if you’re interested in one of those. Beside, even if you have partial hearing loss, you still can benefit from our audio tracks because most benefits come from the sound frequencies and not from the volume. And in case you are totally deaf in one or both ears, our audio tracks may still work because the vibrations should still get to the brain via bone conduction. Note: if you have tinnitus, binaural beats will not work for you. 19. Can I use the audio tracks while working or driving? In theory, Gaia Meditation audio tracks which do not embed Brainwave Entrainment (binaural beats or isochronic tones) could be used in any situation. However, to stay on the safe side, we recommend to never listen to any of Gaia Meditation audio tracks while driving or operating anything dangerous. And remember that audio tracks embedding binaural beats or isochronic tones alter your normal state of consciousness. 20. Can children, pregnant women or people experiencing seizure listen to your audio tracks? Globally, Gaia Meditation audio tracks which do not embed binaural beats or isochronic tones are potentially good for any type of person. If any of our audio tracks embedding binaural beats or isochronic tones were to be used for a person in the above categories, it should only be under the supervision of a healthcare professional. Generally, if you have any sort of medical or psychological condition, please consult your health practitioner and use our audio programs under his supervision. Disclaimer: Gaia Meditation music constitutes a complementary help for health and well-being, and is not intended as a substitute for medical or psychological treatment of any kind. If you are dealing with any sort of medical or psychological condition, experiencing seizures or have any other neurological or neuro respiratory conditions, we suggest you consult with your health practitioner and use our music under his supervision. Gaia Meditation and its affiliates assume no responsibility for the use or misuse of our information or music. Individual results will vary. Use only as instructed – never while operating machinery, driving or performing other hazardous activities. 21. What am I allowed to do with Gaia Meditation® audio tracks? All of Gaia Meditation audio tracks are free to use but for private use only. To get a license, please submit your request here. Please note that our entire website including our music is copyrighted, all rights are reserved. 22. Are the audio tracks royalty-free? Yes. But please note that our music is entirely owned by Gaia Meditation® and is copyrighted. So please refer to FAQ 21 to know what you are allowed to do with our music. 23. Can I open the audio tracks I downloaded directly on my smartphone? All of our audios are in high quality (HQ MP3 320 kbps), so their size is big. Therefore, when you proceed to the free download, you’ll receive a compressed folder (.zip). We advise you to open it from your computer and then transfer your audio tracks on your smartphone. If you would like to open it from a smartphone directly, you’ll need to download a specific application like WinZip or iZip. If you didn’t find your answers in this FAQ, please contact us.